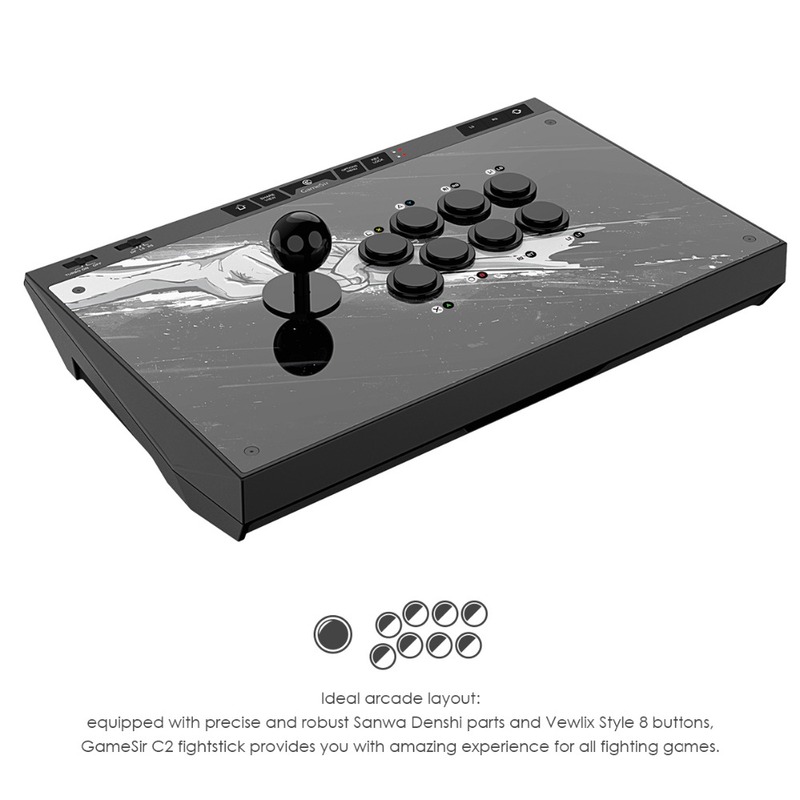 GameSir C2 fightstick is born to bring you arcade experience home. Equipped with arcade gaming buttons and stick, it perfectly reappears the unforgettable arcade gaming age. It features high sensitivity and clicky feeling in game controlling. Compatible with all series of PS4™, Xbox One™, PC & Android*. GameSir C2 fightstick can bring the arcade experience home by perfectly controlling all the gaming characters. Announcing with pride that GameSir C2 fightstick is the innovative controlling machine that supports both PS4™ and Xbox One™ in the market. With SignalSharing technology, it turns on the compatibility on PS4™, PS4™ Slim, PS4™ Pro, Xbox One™, Xbox One™ S, PC & Android*. No matter which camp you stand for, Microsoft or Sony, it always has your back. 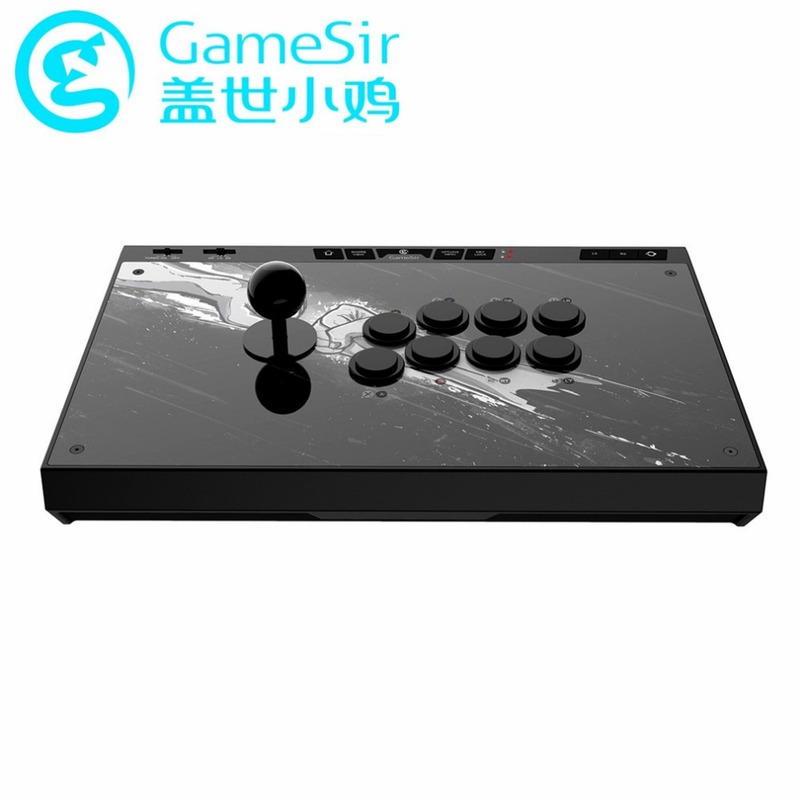 GameSir C2 fightstick adopts Sanwa Denshi-made parts, stick, and buttons original from Japan, which ensure GameSir C2 fightstick’s durability and accuracy when you fight fiercely in games. Meanwhile, it uses solid body material, which is hard to be crashed. Controlling is king. All the buttons are designed as highly sensitive with a clicky feeling by providing the short travel distance and great key feedback to enhance your every precise hit. Also, the joystick has a smooth movement in 360-degree leading the best character controlling attempt. Through exact calculation and manufacture, the joystick is made to chase movements more precisely. By following 8 directions in games, the joystick can be a useful tool to assist you to hit enemies fiercely. Dizzy with complicated button setting and switching procedures? GameSir C2 fightstick will set you free from these troubles! 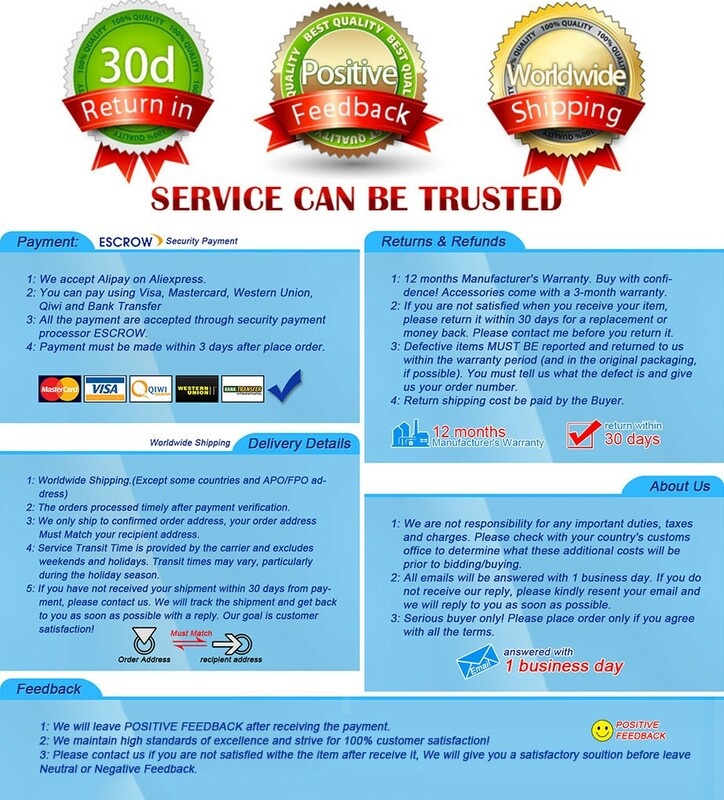 It is equipped with Mode button, which can freely switch the joystick into DP button, LS button or RS button in easy steps. Is it often the case that you touch HOME buttons by accident and hang to the menu during a battle so the enemy might drain your life bar? 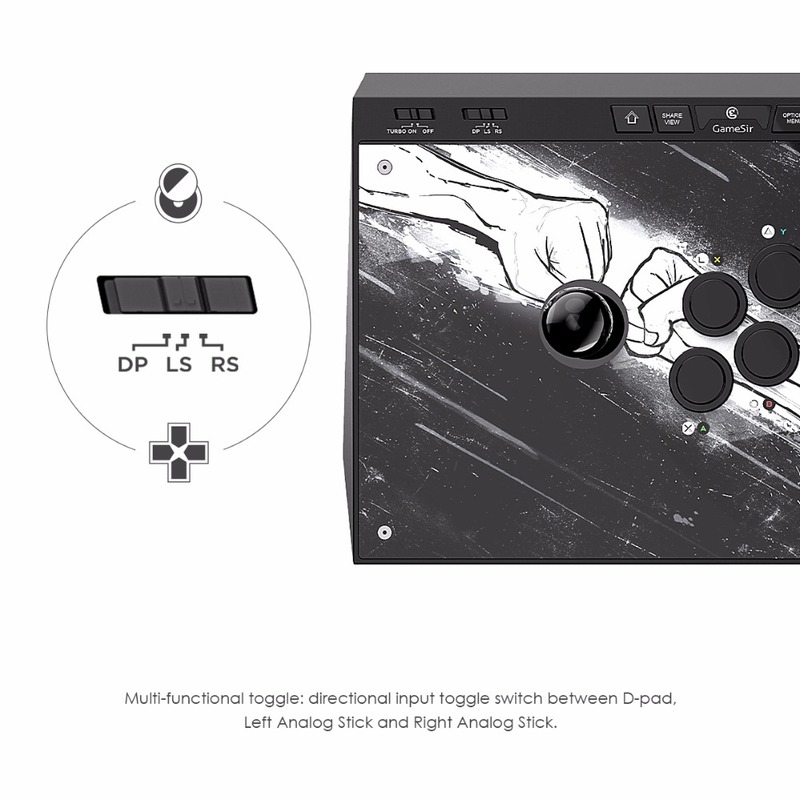 Now you can turn over the embarrassing situation with GameSir C2 fightstick! Featuring the menu lock which can be set to lock & unlock all dangerous buttons such as HOME, SELECT, SHARE, OPTIONS anytime. Never let the mis-hanging interrupt your battle, so go fight and rage at your wish! Shooting and air battling games require high-speed shooting, the TURBO mode will free your hands and make you fully enjoy the hasty TURBO experience of an output command of 10 times per second brought by these buttons. Press just once, TURBO limited times! Tired with changeless faceplate design? 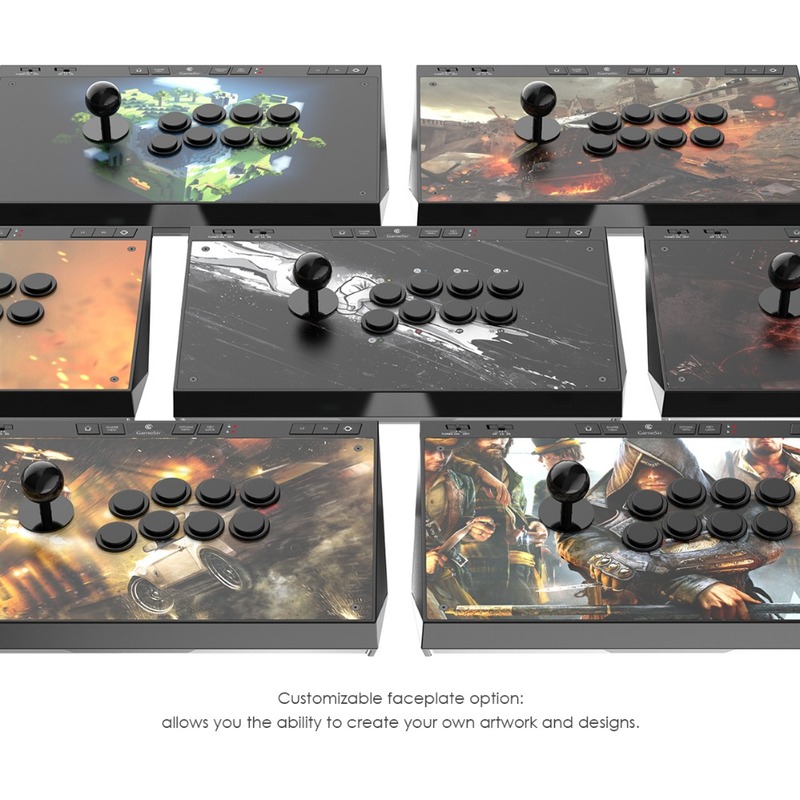 GameSir C2 fightstick provides you the alternative of customizable faceplate option. Following easy steps, you can create by yourself and DIY it to your unique fightstick.